any way, began to devise how he could help her to get free from the savage folk. One day, when Una was left alone, all the woodlanders having gone to pay court to their chief, old Sylvanus, she and Sir Satyrane rode away together, They went so fast and so carefully that no one could overtake them, and thus at last they came to the end of the forest, and out into the open plain. Towards evening, after they had journeyed a long distance, they met a traveller. He seemed as if he were a poor, simple pilgrim; his clothes were dusty and travel-worn; his face brown and scorched with the sun; he leant upon a staff, and carried all his necessaries in a scrip, or little bag, hanging behind. Sir Satyrane asked if there were any tidings of new adventures, but the stranger had heard of none. Then Una began to ask if he knew anything about a knight who wore on his shield a red cross. "Alas! dear lady," he replied, "I may well grieve to tell you the sad news! I have seen that knight with my own eyes, both alive and also dead." When Una heard these cruel words she was filled with sorrow and dismay, and begged the pilgrim to tell her everything he knew. Then he related how on that very morning he had seen two knights preparing for battle. One was a pagan, the other was the Red Cross Knight. They fought with great fury, and in the end the Red Cross Knight was slain. [paragraph continues] Archimago, or Hypocrisy, in a fresh disguise. But Sir Satyrane and Una believed everything he told them. "Where is this pagan now? asked Satyrane. "Not far from here," replied the pilgrim; "I left him resting beside a fountain." Thereupon Sir Satyrane hastily marched off, and soon came to the place where he guessed that the other would be found. 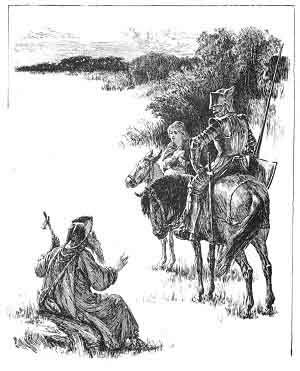 This pagan knight turned out to be Lawless, from whom, you may remember, Una had escaped in the forest, before she was found by the woodlanders. Sir Satyrane challenged Lawless to fight, and they were soon engaged in a fierce battle. Poor Una was so terrified at this new peril, and in such dread of Lawless, that she did not wait to see what the end would be, but fled far away as fast as she could. Archimago had been watching everything from a secret hiding-place. Now, when he saw Una escaping. he quickly followed, for he hoped to be able to work her some further mischief.